Viraj marks his entry in Nisha’s wedding around the time when Kabir came there with his Baraat. Viraj informs all that Nisha’s marriage cannot take place and makes himself heard. He holds Kabir’s collar but he moves his hand away. Nisha’s dad Ramesh asks Viraj to leave from there and doesnt’t entertain him. Viraj’s immediate reaction was pushing Ramesh down with anger playing its part in that misbehavior. Nisha gets a shock to see Viraj again humiliating his family, and also showing aggression. Kabir comes to help Ramesh while telling Viraj to leave from there. Viraj’s life has seen many ups and downs and wanted to not let Nisha, his love marry someone else but he couldn’t succeed in doing so. Amidst all such developments, Nisha finally gets married to Kabir infront of the family by all the rituals. Kabir makes her wear Mangalsutra and shows his concern for her while she carries mixed emotions. Kabir is planning to go away from Nisha after completing three months which is his visa expiration time. He carries hope to find his relative – boy in the photo. Nisha isn’t aware that Kabir & Viraj are brothers, and that revelation & truth as it gets unfolded brings a new twist in her life by giving a shock. Nisha will face Viraj one day as her brother-in law, and has to be seen how she deals with it in her life then. For now, Nisha’s accidental marriage turns real with her decision to choose Kabir over Viraj, and starts a new phase in her life. 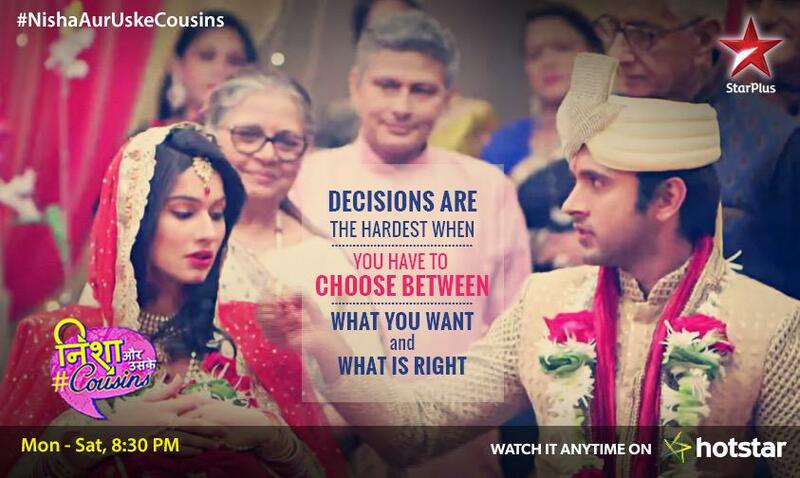 Viraj gets a setback in not able to convince his love and was unable to stop the marriage. He has faced rejection in a similar way to the one he gave to Nisha earlier and its not easy for him. Viraj gets emotional support from Kiara in this situation, and also her decision to speak the truth earlier, and not being selfish makes him awe of her. Where does Nisha’s marriage with Kabir takes them & also Viraj ? Will Viraj be able to move on from Nisha & their love ? It’s such a crap that nisha and kabir gets married.